I am still working on updating my kitchen. 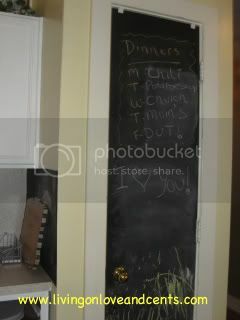 One of the things I did that I am the most excited about is the the menu and message board on the pantry door. It took very little time and money to create it. All you need is chalkboard paint and paint foam roller.. I got both of these at my local Walmart for about $19. To get started I scrubbed the pantry door until it was completely clean. I allowed it to dry completely and then got started. I painted on the first coat and waited for it to dry. After it had dried (about an hour) I did the second coat. I did a total of 3 coats on this door. I followed the directions on the can about prepping the surface and waiting to use the board. Each brand may be different so be sure your read the directions carefully before use. After one week it was completely ready! I use it to keep my weekly menu up and I leave the bottom section for the kids. This may be love notes, reminders, meal requests, lunch ideas or just a drawing. Amazon Gift Card Giveaway! TODAY ONLY! CLOSED!